Jurnal Kefarmasian Indonesia is a scientific journal published by Center for Research and Development of Biomedical and Basic Health Technology, Board of Health Research and Development, Ministry of Health Republic of Indonesia (Pusat Penelitian dan Pengembangan Biomedis dan Teknologi Dasar Kesehatan, Badan Penelitian dan Pengembangan Kesehatan Kementerian Kesehatan Republik Indonesia). The journal publishes original research articles in pharmaceutical science such as Pharmaceutical Technology, Pharmacology, Pharmaceutical Chemistry, Traditional Medicines and Pharmaceutical Care. The journal was established in 2009 while online publication has been started from 2015. The journal is published in Bahasa Indonesia and English. 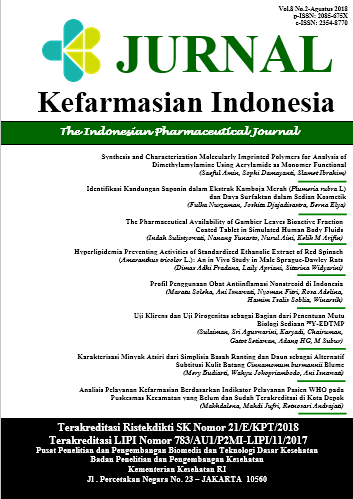 Jurnal Kefarmasian Indonesia is a biannual, open access, peer-reviewed and online pharmacy journal. 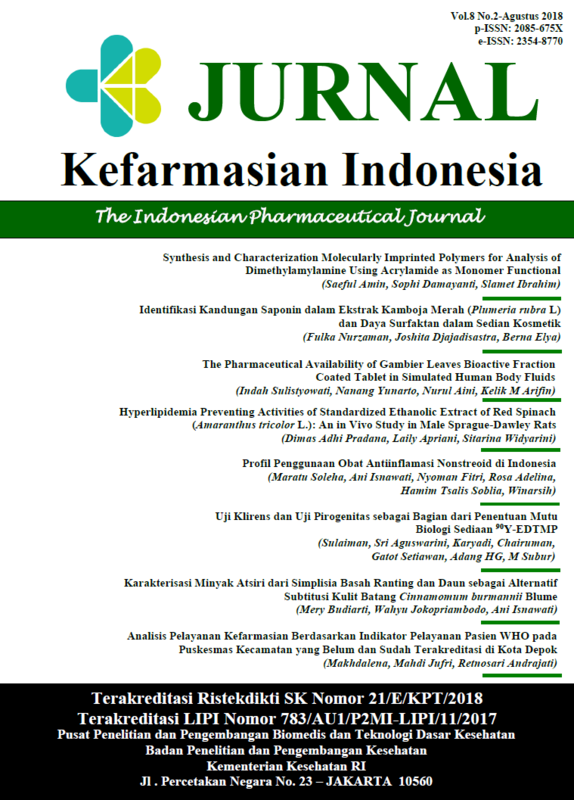 Jurnal Kefarmasian Indonesia aims to serve the updated scientific knowledge for processing manuscript as well as for processing manuscript. The journal has been acredited by Indonesian Institute of Science by Decree No. 783/AU1/P2MI-LIPI/11/2017 and by Ministry of Research, Technology and Higher Education of the Republic of Indonesia by Decree No. 21/E/KPT/2018. Jurnal Kefarmasian Indonesia has been indexed by DOAJ; Indonesian Scientific Journal Database, Indonesian Publication Index, Bielefeld Academic Search Engine, Open Academic Journal Index; Google Scholar; Sinta Garda Rujukan Digital (Garuda). See Google Scholar Profile for Jurnal Kefarmasian Indonesia by clicking here.